Wildflower Murmurs: I sold a doll!! I've made an Etsy sale -- my first since opening shop in May! 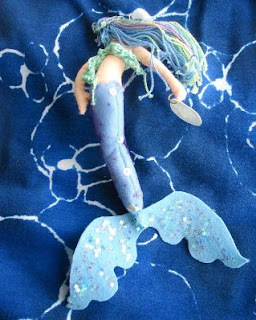 The lucky doodad is the mini mermaid art doll (only 20 cm long), unnamed, made of Japanese craft felt. I was at first thrilled to finally sell something I designed and made (not counting a custom order from an old schoolmate... because I haven't finished it!). And then for the rest of the day, I was terrified that the recipient wouldn't like it. In any case, the package is on its way to the US now, so I'll just have to wait for feedback for the next 4 to 11 business days. Hopefully I'll also get an acceptance/rejection letter for my last short story by then, because I really, really can't help waiting for closure on one project before starting the next.